The word "hybrid" is one that could certainly use some shedding of light. In the world of hot water heaters, there are two very different meanings of the hybrid term. Meaning #1: Something that is powered by more than one source of power (such as a Hybrid automobile - electric & gas). Meaning #2: An idea combining two dissimilar philosophies (for example, a concept may be a hybrid of the academic and business worlds). 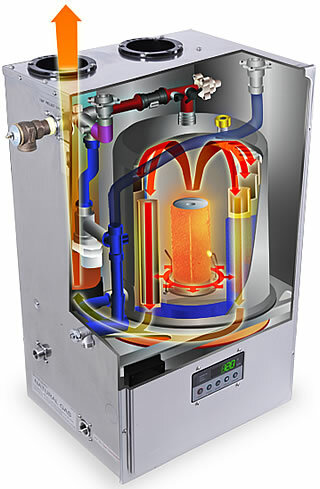 Hybrids utilizing meaning #1 are the electric/heat-pump hot water heaters. The electric portion is your standard electric hot water heater technology where hot water is heated by standard electric heating elements. The heat-pump technology is much more interesting. A heat-pump works like a refrigerator in reverse, pumping the heat from the surrounding air into an evaporator coil at the top of the unit and exhausting cooler air back into the room. Refrigerant is pumped through a compressor further increasing the temperature derived from the intake of warm air. As this is happening, cool water from the bottom of the storage tank is pumped up through the condenser coil where the heat from the coil is transferred into the water and the warmer water is returned back into the tank. This action goes on continually, gradually heating the water without gas and without energy-hogging electric heating elements. There is power to the pump and to a couple of small fans and that's about it. As long as the ambient temperature in the room stays above 45 degrees fahrenheit, the unit can continue heating water utilizing the surround air. If the room temperature drops below 45F, then the electric elements automatically kick in and take over the job reducing the efficiency back to that of an ordinary electric hot water heater. Probably the only negative (if there is one) is that to properly operate, these heaters need to be in a room that holds 1000 cubit feet of air. That's a room 10'x10'x10' or 12'x10'x8' - bigger than your average closet. Our favorite electric/heat-pump hybrids are the Rheem Heat Pump HP50, and the GE GeoSpring Hybrid Hot Water Heater. Both units have an amazing energy factor rating of 2.0 or higher when in energy saver mode, and both units are relatively easy to maintain. With the mild temperatures we get here on the west coast, it's very possible that you could go all year long without the temperature in your garage dropping below the 45F point. Even if there is such a drop in temperature, rarely does the cold weather last for more than a couple of weeks, and you'd be back in high-efficiency mode before you know it. Get a price quote (or questions answered) for a hybrid electric hot water tank. Hybrids using the second meaning are few a far between, but they are water heating systems combining the competing philosophies of tankless and storage tank heating systems. If you've read our section on tankless vs hot water tanks so you know our opinion on tankless. We'd consider ourselves unbiased since we do install both methods of water heating and get paid either way. If ever a tankless unit could make sense, it would be one that has a tank in it. There is a relatively new hybrid on the block (new to Canada anyhow) called the Eternal Hybrid Water Heater (pictured right). We've gone and checked one out and liked what we saw. The storage heater is a small 2 gallon condenser style unit meaning that it re-uses the exhaust heat over and over again making this a very efficient unit – its claimed to be 98% efficient. There are two versions, the GU195 and the GU145. The GU195 gets its name from the fact it can handle 19.5GPM (gallons per minute) of flow with a 20 degree fahrenheit temperature rise (its smaller brother likewise handles 14.5GPM @ 20F rise). To compare apples to apples, we kind of have to consider how it performs with a 35 degree temperature rise, and when we do it clocks in at a respectful 11.5GPM! By the time we get the temperature up to where I can have my 105F degree shower that I'm wont to do, the flow is reduced to 6GPM. This is still an acceptable amount with enough flow remaining to simultaneously run a wash machine or a dishwasher while I'm in the shower. Also, since there is a storage tank, there is no fear with being on the receiving end of the old "cold water sandwich" gag (see tankless vs hot water tanks if you don't know what this is.) Something you need to be aware of though, is that the hot water in the small storage tank is only accessible while there is power to the Eternal unit. If there is a power failure, like all other tankless units, the computer is dead and so are all the water controls – so no hot water for you! If you have no concerns about power failures and really want to go tankless, then this is the tankless unit I'd recommend – the tankless unit with a tank. Get a price quote (or questions answered) for a hybrid gas hot water tank.